Interest rates have been of paramount concern for investors for several years given extremely low, and in some cases negative, levels in much of the developed world. The yield on the 10-year US Treasury has recently pierced the 3% level and now stands at 3.1%. The US Federal Reserve is poised to raise the upper band of the fed funds rate another 25 basis points to 2.25% on September 26 and many Fed watchers expect the central bank to continue raising rates until at least June 2019. Market participants are concerned that Fed activity will ultimately lead to an inversion of the yield curve and when that has occurred in past cycles, recessions often have followed. 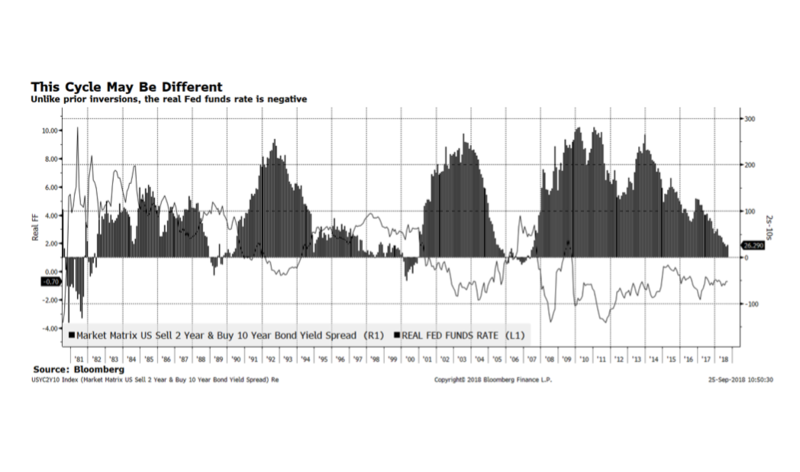 What is different this cycle is that the real federal funds rate is negative due to the Fed’s highly accommodative policy stance and, as shown in this week’s chart, have only experienced a yield curve inversion when the real fed funds rate is in positive territory. There are many other factors that may influence this relationship and a considerable force, in our opinion, is central bank policy and the direction of interest rates in the rest of the world. In August, the Bank of England raised their policy rate to the highest level since the financial crisis and the European Central Bank may begin to raise borrowing costs by the end of this year.